Thank you for signing up for a trial of Zoho CRM. The trial gives you immediate access to Zoho’s free edition. 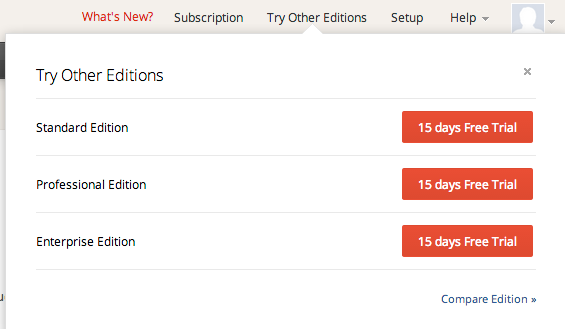 To take full advantage of the trial, click on the “Try Other Editions” link at the top right in your free edition (see below) and test the Standard, Professional, or Enterprise editions. No credit card is required. You can reach your login page from this link: crm.zoho.com. When your trial expires, you can continue to use the basic edition of Zoho CRM for free (customized fields and other modifications may be lost, but contacts, accounts, an other details you’ve added in the standard fields will be retained). Questions? Contact us @ 781-606-0433 or use the chat, in the right hand corner, below. Have fun test driving Zoho CRM!